Schools can fax P.O. to 818-914-4140 Our address is on the CONTACT page. We are a husband/wife team – not a massive film studio. Please support us by buying the appropriate priced DVD for your use. 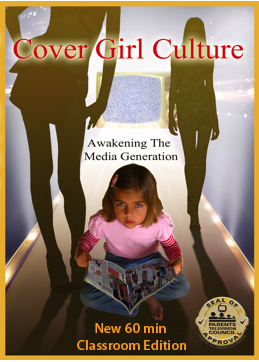 Educational License COMBO DVD PAK: Cover Girl Culture Classroom Edition PLUS Seeing Through the Media Matrix companion DVD. FREE Teacher’s Guide! For screenings in libraries, classrooms, girls’ organizations and churches. SCHOOL/ LIBRARY DVD: For screenings in libraries and classrooms. New 60 minute Classroom edition The purchase of this DVD will include a FREE Study Guide (pdf) to help teachers/educators easily create a class around the film with Key Topics, Questions and Activities. (for grade/learning level 8-12) Purchase includes rights to show the film in libraries or other settings at the acquiring institution, for which there is no admission fee. New 60 minute Classroom editionPurchase of this DVD will include a FREE Study Guide (pdf) to help teachers/educators easily create a class around the film with Key Topics, Questions and Activities. (for grade/learning level 8-12) Purchase includes rights to show the film in the acquiring church or other settings at the acquiring institution, for which there is no admission fee. WHY THE PRICE DIFFERENCE? Some people scoff at the price difference of the HOME DVD vs SCHOOL/LIBRARY. When I started my documentary I didn’t know there was a price difference in DVDs sold to home vs schools/churches. I had to become educated as to the laws and reasons why this is so.What I learned:One major reason is the number of people who will potentially watch the film at home versus at a school/library/church is drastically different. It is a PUBLIC screening.$20 allows home viewing – roughly 10 people will see it. Maybe more if you have a big family or friends come over. $79 allows school/library/church – roughly 50-300 will see it in a year (x) times endless years. This reduces the number of home copies sold and therefore the price difference. It works out to a few cents per viewer. $225 for universities allows hundreds of students to see the film every year for endless years. Some teachers/groups will download movies for free (illegally) and show it to large groups to the loss of film makers. We are a husband and wife team, not a massive film studio that can afford the loss of sales due to piracy, theft and cutting corners. If you believe in our work – vote with your dollar and support us. Without sales we cannot continue to make documentaries. My husband and I created this website ourselves and funded the making of the film with our savings,over 5 yrs. I handle packing/shipping of DVDS, maintaining the website, accounting, FB posts, working on new projects and other less exciting things. If I were in this for the money, as one upset customer complained about the school price, I would have stayed in modeling or gone into another line of movie making. 😉 This is my passion and I believe it to be a worthwhile one. Thank you for your support. If you’ve borrowed my film from a friend please feel free to donate a small amount to help me continue my work. Even if just a dollar or two.